Finally, the concert pages (Korean English) are open! Airen 5 members can certify their membership after 2pm KST today (October 18). Be sure to enter your birthday as ‘YYYY-MM-DD’! This is the only chance to meet Lee Seunggi as a musician. 2013 Lee Seunggi’s Hope Concert is already in its 5th year. Always showing something new every year, Lee’s back with original music and performance. You’re invited for a delightful date with Lee Seunggi, a great musician. This entry was posted in Concert, Event/Notice and tagged 2013 Hope Concert, 이승기, Lee Seung Gi. Bookmark the permalink. Then when will non airen5can buy ticket? Thanks. They said details does not match their records! Your birthday should be entered as ‘YYYY-MM-DD’, NOT as a 6-digit number as stated on the official fan club’s notice. Yes, had enterted the 6 digit previously. Thank you very much, Tryp! Good luck to everyone who’s trying to get a VIP ticket – or any ticket lol. I’m sure they sell super super fast! I have done The airen 5 member confirmation, will I be receiving any notice or email ? I think the only notice you’ll get is the message ‘Confirmation has been processed’. Hi Tryp, Not sure if you help. I’ve been trying to reconfirm since yesterday. Everytime, I have been receiving the same message “Member reconfirmation with a same ID is restricted. Will you continue confirmation process.” When I select YES, it prompted “Account information does not match with our records, Pls retry again.” I hv entered my name and B/date as per MyPage. I’ve sent an email to tickethelp@interpark.com but recd a returned delivery error. Any idea? Hmm, I’m not sure what could be wrong. I heard that some Chinese fans had problems yesterday because they logged in from the Chinese site. But you’re logging in from the English site, right? For ‘Name’, you have to enter your full real name, and for ‘Birthday’, it should be ‘YYYY-MM-DD’. But if you’re already doing everything correctly, interpark may not have your correct Airen 5 membership info. Then you may want to call them (there’s a phone number listed in here). Hi Tryp, sorry to bother you. 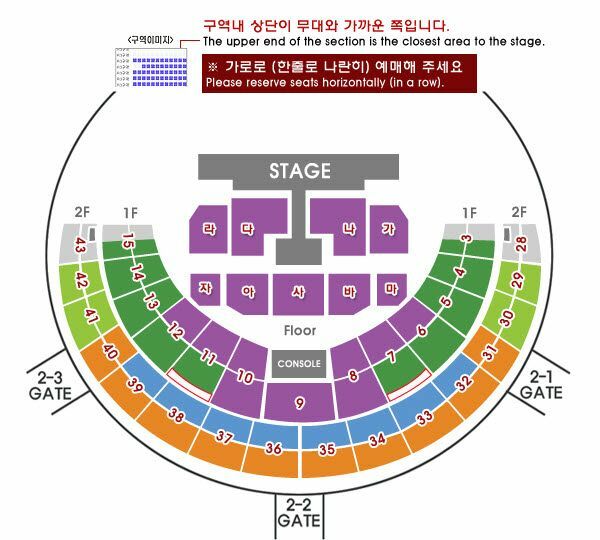 I recall for 2012 Hope Concert, there is a seating chart for the concert that showed the T-stage and sub-stages, not the generic seating chart for Gymnasium Hall that are shown in interpark english website. I did not see any seating chart for 2013 Hope Concert. I am not sure whether i miss it. Is it shown in the interpark english website? Thank you. No, this year’s seating chart hasn’t been released yet. We probably won’t see it until next Tuesday. Thank you… I will keep a lookout for it! Cheers. I have a question…what are the “little extras” of a VIP Ticket? Do I get a special item? Or is it only because I am sitting nearer the stage?